They sent me three supplements as part of their Hormone Balancing Programme. First up - what are hormones and why are they important? Well since you asked and to put it very simply.... hormones are our body's chemical messengers. They effect a huge number of processes in the body including mood, development, growth, sexual function, metabolism and reproduction... So its basically vital that the body is hormonally balanced - otherwise we just couldn't function. What causes hormones to become unbalanced? When you think of unbalanced hormones, you might think its just women going through menopause who are affected - but in fact lifestyle, STRESS, medication, diet or pregnancy can all also cause an imbalance in anyone.. I am not sure if my hormones need balancing - I haven't had them tested but as I am currently under a lot of stress...they probably do need re-adjusting... The cortisol knows how to trickle its way in and I have to work really hard at cooling the system and managing it. And as I am currently finishing my degree, I welcome ANY kind of extra nutrients that are going to support and help my brain functioning. So out of all of these products, my favourite would be the Omega 3 fish oils. I do eat a lot of fish already so I am sure my brain already gets good doses of Omega. I am not a huge supplement taker and I wouldn't advocate it for everyone - I used to be but now only occasionally take Vitamin C, Multivitamin, Magnesium etc.. I worked somewhere last summer where EVERYONE was popping supplement pills all the time - you could actually hear the crunchy / rattle sound when they walked. It is well known in the food / health industry that having a healthy gut can have a huge impact on overall health. The health of the gut depends on which nutrients the body will absorb. I wrote a university essay last year on functional foods and chose probiotics specifically to write about - I scored highly in this essay and did a wide amount of reading on the subject. Many, many studies have shown that there is not enough evidence out there to suggest that probiotics are widely beneficial. I would take them briefly if I had been on antibiotics or was going abroad - but not all the time. 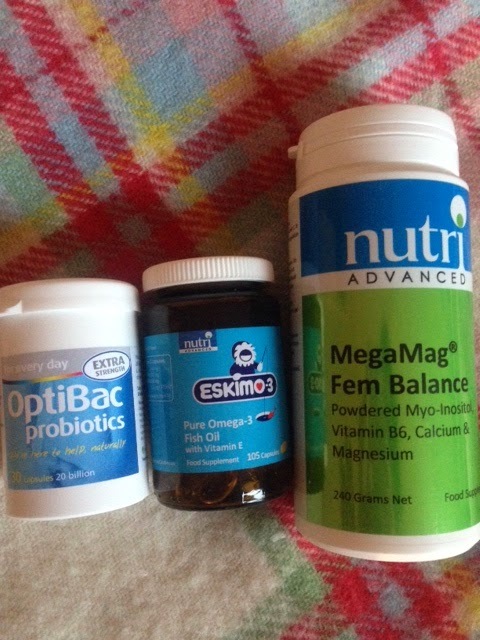 Finally - the MegaMag Fem Balance: I think its sometimes great to have a powder that has everything you need in it. You have to mix this with water and drink it - you get used to the taste but its not the most delicious thing in the world - I wonder if it tastes different / better in smoothie? The powder contains Vitamin B6 and its not advised to take this long term. I like this powder for its high dose of Magnesium and Vitamin C. I've taken Magnesium Citrate before for anxiety and it really works. To conclude - this Hormone Balancing Programme will work for some people but not everyone - not least because different things work for different people. I am not a huge advocate of taking supplements - studies have shown that they aren't always effective and those who do take them are likely to be well-nourished and take an interest in leading an active and healthy lifestyle already.